Provides a clearing action up to 6 levels. 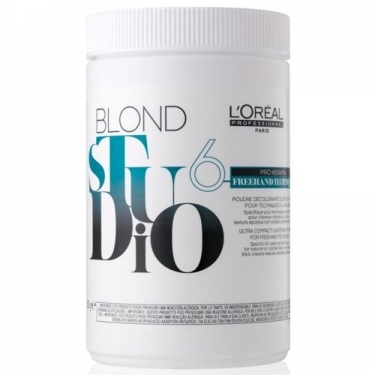 DESCRIPTION: Blond Studio Freehands Technique Powder from LOréal Professionnel is a bleaching powder ideal for freehand techniques without the use of silver. This thick, creamy, non-volatile texture allows you to create precise strands and offers up to 6 levels of lightening. Especially suitable for outdoor techniques, creative balayage, hair surfing and hair painting. It leaves the hair more natural and allows an endless number of possibilities, from the cold laurel, to the blond honey, to the bronze, combined with mocha tones. 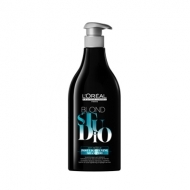 The Blond Studio line is a full range of discoloration with greater lightening power, more neutralization and better results. Mix in the ratio 1 + 2. Pause time 20 to 50 minutes.